Download "Comparing the Results of Support Vector Machines with Traditional Data Mining Algorithms"
3 a number of possible values for the parameters used in the algorithms, while using cross-validation for model selection. The software also performs automatic pre-processing of data. III. RESULTS Table I displays the method, features used, sample size, and lift for a number of analyses. TABLE I LIFT VALUES Method Features used N Data mining tool Test set lift original data set 4, original data set 250, components 4, components without squared variables 4, components 250, original data set 250, variables 250, components without squared variables 250, variables 4, No SVM with all variables and features were run because in these cases LIBSVM either halted unexpectedly or would not produce any indication of progress after 20 hours. The analysis was then attempted with SVMlight , but the same problems occurred. The size of the dataset was reduced by including all of the positive responses (n = 2,125) and a random sample of 2,125 negative responses. The opposite problem occurred with the data mining tool and logistic. With these two techniques overfitting occurred when the data sets were reduced. Therefore logistic and the data mining tool used the entire data set. The grid search feature of LIBSVM was used to find the ideal values of the C and gamma parameters when using the radial basis function kernel in the SVM model. The C value is the familiar penalty parameter used with SVMs. The gamma parameter is a value that is used to scale the kernel so that the values do not get too large. It is possible that with 577 features, the SVM analysis cannot separate the data well because the important variables get lost among the many unimportant ones. Therefore for one comparison, principal components analysis was used to reduce the number of features. This was done twice, once including the squared values and once not including the squared values. As seen in Table I, using principal components had a very small effect on the results. 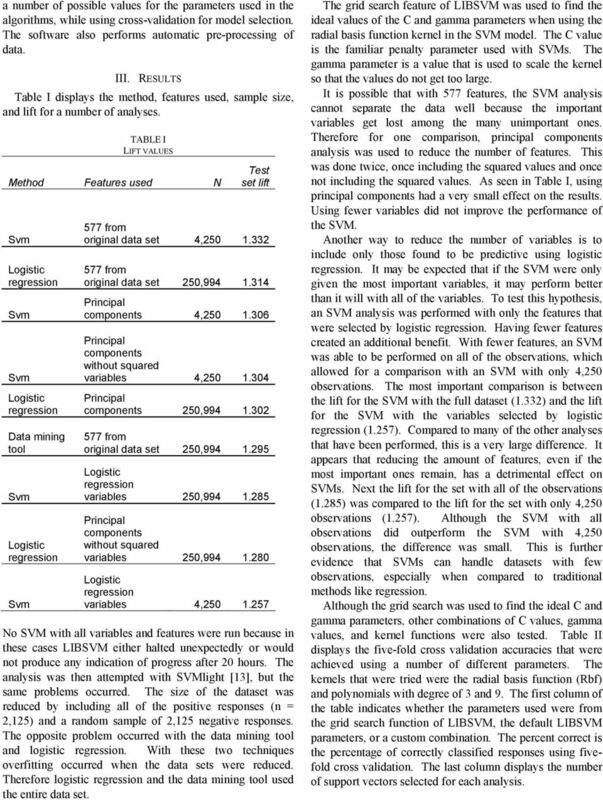 Using fewer variables did not improve the performance of the SVM. Another way to reduce the number of variables is to include only those found to be predictive using logistic. It may be expected that if the SVM were only given the most important variables, it may perform better than it will with all of the variables. 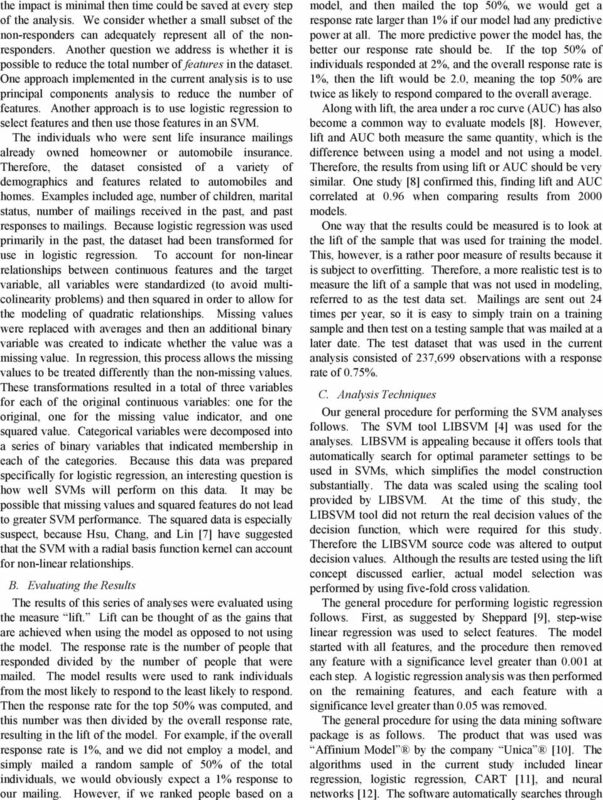 To test this hypothesis, an SVM analysis was performed with only the features that were selected by logistic. Having fewer features created an additional benefit. With fewer features, an SVM was able to be performed on all of the observations, which allowed for a comparison with an SVM with only 4,250 observations. The most important comparison is between the lift for the SVM with the full dataset (1.332) and the lift for the SVM with the variables selected by logistic (1.257). Compared to many of the other analyses that have been performed, this is a very large difference. It appears that reducing the amount of features, even if the most important ones remain, has a detrimental effect on SVMs. Next the lift for the set with all of the observations (1.285) was compared to the lift for the set with only 4,250 observations (1.257). Although the SVM with all observations did outperform the SVM with 4,250 observations, the difference was small. This is further evidence that SVMs can handle datasets with few observations, especially when compared to traditional methods like. Although the grid search was used to find the ideal C and gamma parameters, other combinations of C values, gamma values, and kernel functions were also tested. 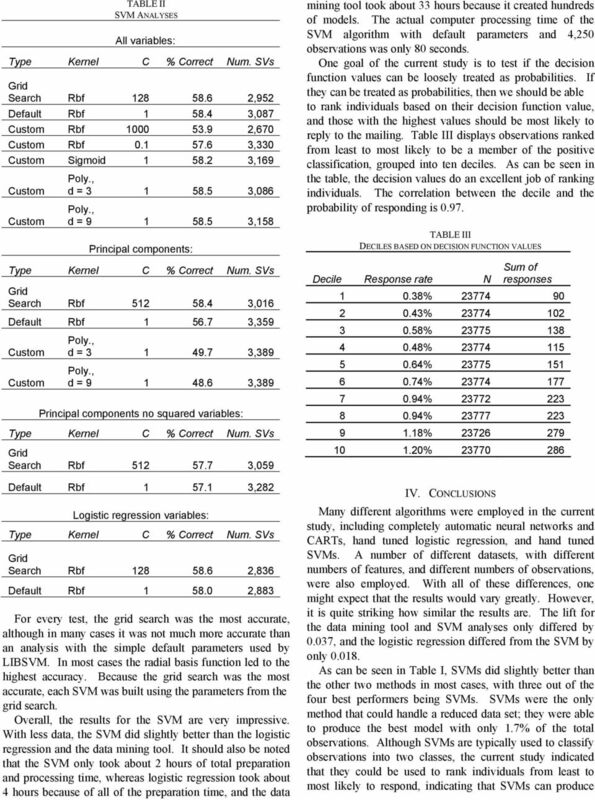 Table II displays the five-fold cross validation accuracies that were achieved using a number of different parameters. The kernels that were tried were the radial basis function (Rbf) and polynomials with degree of 3 and 9. The first column of the table indicates whether the parameters used were from the grid search function of LIBSVM, the default LIBSVM parameters, or a custom combination. The percent correct is the percentage of correctly classified responses using fivefold cross validation. The last column displays the number of support vectors selected for each analysis. 5 values that can be loosely interpreted as probabilities. SVMs also did well with the simple, default parameters offered by the LIBSVM software, therefore creating the SVM models was very simple. Yet another benefit to using SVMs was that including 577 features did not produce any overfitting, even though the results of the logistic indicated that most of the features were probably irrelevant. Therefore, the extra step of selecting the most relevant features was not required for the SVM in the current study. In conclusion, SVMs did an excellent job of ranking individuals for the current dataset. SVMs were able to do just as well as a complex, well-engineered data mining tool and the handcrafted analysis of a domain expert. It seems likely that in the future more data mining packages will begin to include SVMs. Although the results of this study appear interesting, it is important to note that they only apply to the current dataset. Further research could investigate whether the results of the current study replicate with other datasets. Further research could also use different methods to produce exact probabilities from SVMs, and could use the area under the ROC curve as an additional metric to evaluate the models. REFERENCES  B. Scholkopf, and A. J. Smola, Learning with Kernels. 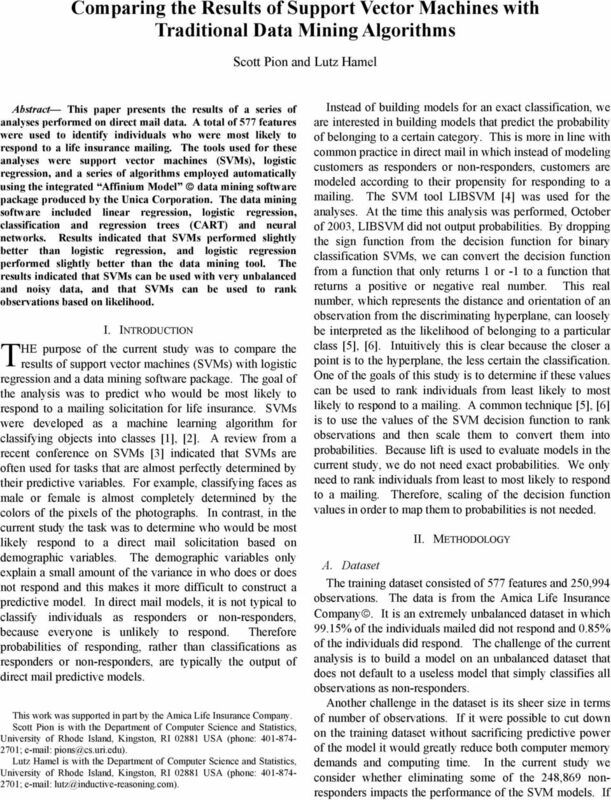 The MIT Press, Cambridge,  V. Vapnik, The Nature of Statistical Learning Theory. New York: Springer-Verlag,  S.W. Lee, and A. Verri, Eds. SVM Berlin, Heidelberg: Springer-Verlag,  C. Chang, and C. Lin (November 12, 2003). LIBSVM : A library for support vector machines. Software available at  J. Drish, (April 12, 2007). Obtaining Calibrated Probability Estimates from Support Vector Machines. Available:  S. Ruping, A simple method for estimating conditional probabilities in svms, in LWA Lernen - Wissensentdeckung - Adaptivitat. A. Abecker, S. Bickel, U. Brefeld, I. Drost, N. Henze, O. Herden, M. Minor, T. Scheer, L. Stojanovic, and S. Weibelzahl, ed., Berlin: Humboldt-Universitat,  C. Hsu, C. Chang, and C. Lin (November 12, 2003). A Practical Guide to Support Vector Classification. Available:  R.Caruana and A. Niculescu-Mizil. Data mining in metric space: an empirical analysis of supervised learning performance criteria, in Proceedings of the Tenth ACM SIGKDD international Conference on Knowledge Discovery and Data Mining. New York: ACM Press,  D. Sheppard, Statistics and Modeling for Direct Marketers Seminar, New York, New York,  Unica Corporation, Unica Affinium Model er Segmenter Version 5.0,  L. Breiman, J. H. Friedman, R. A. Olshen and C.J. Stone, Classification and trees. Belmont, CA: Wadsworth International Group,  C. M. Bishop, Neural Networks for Pattern Recognition. Oxford: Oxford University Press,  T. Joachims, SVMlight: Making large-scale SVM Learning Practical, in Advances in Kernel Methods - Support Vector Learning. B. Schölkopf, C. Burges and A. Smola ed., Cambridge, MA: MIT-Press, 1999. Machine Learning Logistic Regression Jeff Howbert Introduction to Machine Learning Winter 2012 1 Logistic regression Name is somewhat misleading. Really a technique for classification, not regression. Data Mining. Supervised Methods. Ciro Donalek donalek@astro.caltech.edu. Ay/Bi 199ab: Methods of Computa@onal Sciences hcp://esci101.blogspot. Insurance Analytics - analýza dat a prediktivní modelování v pojišťovnictví. Pavel Kříž. Seminář z aktuárských věd MFF 4.